13 Nov 2018 --- Leading global flavor house Givaudan, which marks its 250th anniversary this year, has evolved far beyond its roots to identify itself around the more holistic concept of “taste” rather than mere “flavor” alone. This business dynamic has led the Swiss-headquartered flavor giant to acquire natural extracts supplier Naturex earlier this year. In September 2018, Givaudan completed the acquisition of Naturex, following the implementation of a squeeze-out procedure and the delisting of Naturex shares. The deal valued the French-headquartered supplier at around €1.3 billion (US$1.61 billion), or a roughly 42 percent premium over its market capitalization, before it was announced at the beginning of the year. “We were the world leader in natural flavors before the acquisition of Naturex. We have been selling the largest portfolio of natural flavors for a long time. We are strengthening this,” Hartnacke stresses. Givaudan’s roots go back 250 years to Grasse, France, where perfume was used to offset odors from the tanning process in glove-making. “There, in 1768, Antoine Chiris transformed his passion for perfume from an artisanal business into an empire,” the company writes in a promotional piece on the milestone. “Givaudan is a 250-year-old company that has always maintained a balance between organic growth and merging with partners who complement our capabilities and product portfolio,” says Hartnacke. “The Naturex acquisition is the latest testimony to this, where we acquired a company that is a good strategic fit with Givaudan culturally. From a consumer perspective, it sits in the sweet spot of what consumers expect from their product. Let’s see how we go forward. For the time being, we are there to make this successful,” he adds. “That has been our motivation and driver all along and that has not changed,” he says. What has changed in the last decade, however, has been the incredible growth at the company, initially fueled by the acquisition of Netherlands-headquartered Quest, which was completed in 2007. Consolidation has been the order of the day in the industry, as all the biggest flavor players look to the notion of taste as opposed to mere flavor. As well as Givaudan’s move for Naturex, this year, International Flavors & Fragrances (IFF) became the number 2 player in the flavors space through its move for Frutarom. But Firmenich is regularly strengthening its position in the concept of taste too, with a new clean label platform announced earlier this year, while Symrise has expanded strongly through its integration of Diana. Commenting on the wave of consolidation in the flavors sector as a whole, Hartnacke is quick to point out that it is not only about “consolidation” but also about “evolution.” “When you think about the Naturex acquisition, it was not exactly a flavor peer. In that sense, while we may have acquired a larger share of the flavor market, it offers complementary deals and capabilities. It is evolutionary,” he adds. Bolt-ons in technology terms are constantly being considered too, he notes. “We bought Vika, Activ International and Centroflora, which are all bolt-ons from that perspective, as they fill certain portfolio gaps. It is all about having the same strategic direction of building the natural and clean label portfolios in different areas of our ingredient palette,” says Hartnacke. which includes the input of Michelin star chefs. A key reason for the evolution of the flavor market is the dynamic background to the industry in itself. It has always evolved and will continue to do so. “It is a dynamic business that has always changed as it anticipates and follows the consumer. It is about the tastes that they want to eat and experience and that has been dynamic all along. This is the result of the way in which people started to travel more and explore different cuisines. We are there we enable that and explore the tastes with them and to make the tastes available in products. That has always excited us,” he says. Interestingly, Innova Market Insights, which announced its top ten trends for 2019 today, has listed “Discovery: The Adventurous Consumer” as it’s number 1 trend amid this market dynamic. Flavor, innovation and the discovery of new tastes and experiences are all exciting aspects for consumers and platforms where Givaudan will continue to innovate. A more recent evolution, however, has been around consumer demand for healthier products, which has inspired flavor creativity in reformulation. “It is about having balanced products with the right nutritional profiles, allowing them to manage the salt, sugar and fat in their diet. That is certainly something that drives them. At the same time they want authenticity and to understand what’s in their products and that it is safe. We play a big role in that too,” he adds. Hartnacke stresses the company’s strong role across the globe. “While I am in charge of EMEA, we have strong businesses in Asia-Pacific, North America and Latin America. We are finding growth opportunities geographically, but also in business segments. We find what we call ‘high growth markets’ in all parts of the world. We are not limited to a specific area,” he says, further declining to comment on specific regional growth areas and targets. Other R&D platforms revolve around protein and healthier reformulation. The company is involved in the Plant Meat Matters project, a consortium led by Wageningen University & Research in the Netherlands, which is working to produce plant substitutes for beef. Launched in 2017, the four-year project is reportedly progressing well, with the first products expected to be available from 2019. Innova Market Insights listed “The Plant Kingdom” as its number 2 trend for 2019. 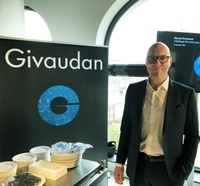 “Protein is another interesting area for the consumer and one Givaudan is active in. As a macronutrient, protein plays an increasingly important role for consumers. We are also looking at taste solutions in sweetness, but also in terms of salt and fat reduction,” he notes. The rising demand for natural ingredients will surely put pressure on supply chains when it comes to finite resources. “Sustainable sourcing is very important for us. This is certainly a combined responsibility between R&D, our supply chain and procurement, who ensure that we work on strategic partnerships with those who grow the crops. These challenges that come with all natural ingredients relate to weather, crop cycles and more. But we are finding holistic answers,” he says. Hartnacke lists Givaudan’s efforts around the iconic taste of vanilla as an example of this. “We have a fantastic joint venture in Madagascar, where we have an extensive collection network on the ground to procure the vanilla beans directly from the farmers. We also invest in the sustainability of their livelihood,” he adds. For Hartnacke, ensuring that Givaudan’s flavors and taste technologies are still being used in products in the next decades, never mind 250 years further down the line, is about reinforcing relevance. “At the end of the day, a consumer wants a great tasting product and they expect certain ingredients to give that,” he says. “This is our biggest reason for existing, helping to offer the best tasting products for consumers together with our customers. We are developing our capabilities, raw materials and technologies to do that within the expectations of what has been written on the label. I have no doubt about our relevance,” Hartnacke concludes. 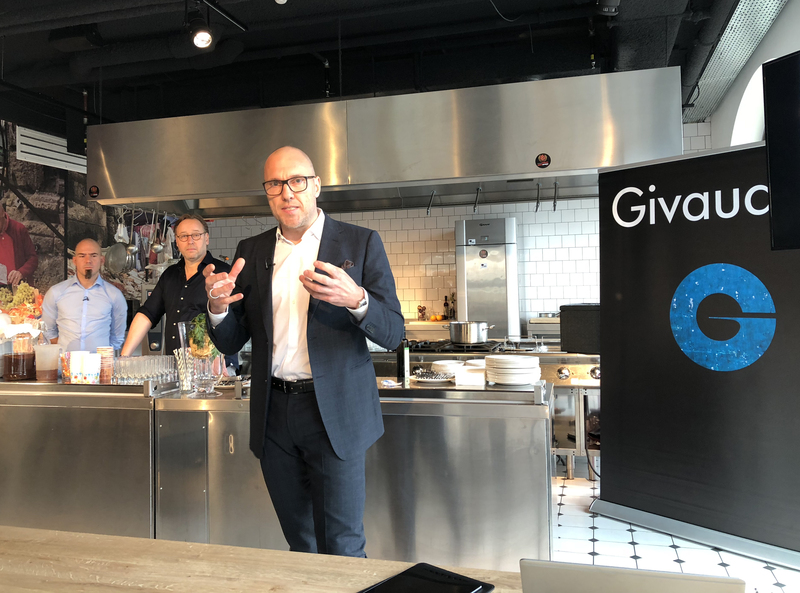 Hartnacke was in Amsterdam as part of a Givaudan press demonstration of a more holistic approach to sugar reduction, which includes the input of Michelin star chefs. Hereby the flavor house is increasingly targeting an untapped consumer demographic that prefers less sweet products with plenty of body. These consumers don’t want bland and watery lower sugar products, but instead are calling out for true sensory experiences, albeit less sweet ones. In order to achieve this complex balancing act, a strong approach to sensory is required. “You need to understand how sugar fills your mouth with a certain fullness and richness, how it lingers in your mouth and fades away. Only when we understand the components of how sugar works and are able to describe, measure and compare other sweeteners to it, are we able to work with it to create commercial solutions that are satisfying to consumers when we tackle sugar reduction,” he notes in his presentation. Stay with FoodIngredientsFirst for a detailed insight into Givaudan’s holistic approach to sugar reduction later this week.